The World Wide Fund for Nature, WWF, and the Ministry of Forest and Wildlife, MINFOF, have resolved to integrate indigenous people in the management and classification of forests in Cameroon. MINFOF officials say the involvement of the indigenous population is a condition for the success of the new forestry policy in the country. "The participation of the population indicates their partnership with the State in the protection of the environment in general and the forest in particular. The government and the citizens are joining efforts to protect and preserve the national heritage," noted Bakia Mor-Achankap of the Southwest Regional Delegation of Forestry and Wildlife. Christened Village Forest Management Committee, VFMC, this is the structure crafted by WWF and MINFOF to liaise with the population and defend their interest for the preservation of the environment. It is from this backdrop that 35 VFMCs have been commissioned in the Bakossi National Park Area of the Kupe-Muanengouba Division, Southwest Region. According to Thomas Amin, Divisional Delegate of Forestry and Wildlife, Kupe-Muanengouba, it is important to bring in the VFMCs so that they can be able to better solve their problems and defend their rights. "The VFMCs must become the favoured representative for the village. These VFMCs will have an essential role to play in putting in place a system for the rational and sustainable management of the surrounding forests," Amin said. Amin explained that the VFMCs are the intermediaries between the forestry administration, WWF and the local population. "They are organs of consultation, negotiation and participation of the population in the management of forest resources." Bakia gave insights on how involved the population is in the forest management. 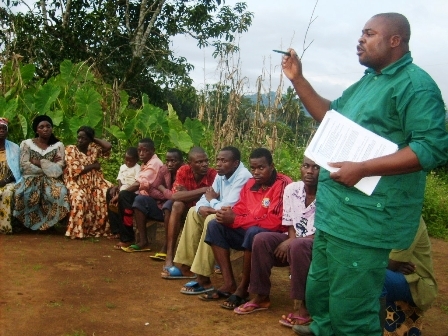 "The VFMCs are initially sensitized on their obligations and responsibilities, while capacity building mechanisms put in place, remunerated maintenance/management works are carried out, feedback from VFMCs is taken into account and the empowerment of the population on how to realise their interest and their natural resources in a sustainable manner." Bakia added that the VFMCs in Kupe-Muanengouba Division are also expected to participate, actively, in the elaboration of the Bakossi National Park. Following the installation of the elected members of Ndibse II VFMC, Chief Ivosen Maths Ekane of Ndibse II Village, expressed satisfaction on the positive change of attitude of Cameroonians towards forest management. However, he expressed caution on the forceful displacement of the population in the forest zone. He promised that his community will respect the rules and regulations put in place by WWF and MINFOF, while looking forward to other necessary directives. Rosemary Emuke, Treasurer of the Ndibse I VFMC, understands what awaits them but she thinks that WWF and MINFOF should exercise patience as they put into action the new management policy of the Cameroonian forest.